A new Irish Sign Language version of the National Anthem has been officially performed for the first time by a deaf choir and a piper from the Defences Forces band. The historic performance took place in Leinster House at the launch of a report that advocates protocols around the use of the anthem. The rapporteur of the Seanad Public Consultation Committee report, Fianna Fáil Senator Mark Daly, explained: "Next year is the 110th anniversary of the writing of the national anthem by Peadar Kearney. "In 2013 the National Anthem fell out of copyright protection so we looked at the issues around its proper to make sure it wasn't used inappropriately. We have came up with protocols so all citizens are aware of the proper use and treatment of the National Anthem." 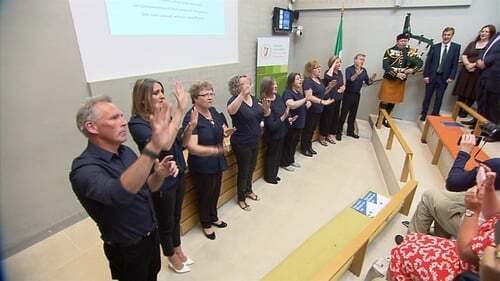 The proposed protocols include the versions of the anthem in Irish, English and Irish Sign Language, as well as the musical notation provided by the Irish Defence Forces School of Music. Senator Daly said: "Last December we passed the Irish Sign Language recognition bill for the deaf community. Alain Newstead, a student from Bishopstown Community School in Cork, came into the Seanad public consultation. He said he felt excluded as a citizen of this State and a member of the deaf community as there was no sign language version of the national anthem." It was from that student's proposal that today's historic rendition from the deaf choir and Corporal Anthony Kelly of the army band for the deaf community came about. The Seanad committee found that the majority of Irish people want the existing wording of Amhrán na bhFiann/The Soldier's Song to remain unchanged. Conal Kearney, whose grandfather Peadar Kearney wrote the lyrics to the anthem, said his grandfather would have been hugely proud today "on such an historic moment." He added: "I believe it was a privilege to see for the first time the Irish Sign Language version of Ámhrán na bhFiann/The Soldier's Song. It was a very proud and emotional moment." Mr Kearney said that he made a submission to the committee last December that the committee would be given the legal protection the anthem "so rightfully deserves, equal as a symbol of State to the harp and the tricolour. I believe that will happen. We are just at the start of a process." Today's report advocates that every primary and secondary school should be provided with the National Anthem in Irish, English and Irish Sign Language to assist in the teaching and learning of it. On the eve of St. Patrick’s Day, schoolchildren should be encouraged to hold events where the National Anthem could be performed in Irish, English and/or Irish Sign Language. These annual events could also include a celebration of our national flag and the anthems and flags of children of different backgrounds. The chairperson of the Seanad committee, Paul Coghlan, said,"This is more than a first step as the National Anthem has been given a status that it did not have until now despite the great usage across so many sporting organisations." Responding to criticism that the protocols for the anthem will not be be enshrined in legislation, Mr Coghlan said: "The committee was unanimous in support for these proposals. It operates on the basis of consensus and we are proud of the report." Liam Ó Rinn translated the song into 'Amhrán na bhFiann' and the Irish version was first published in 1923. The current Lord Mayor Dublin Nial Ring, the grand-nephew of Mr Ó Rinn was in attendance at today's launch.